Tyre Recycling Machine Line_Raymond mill Machine_Mining Machinery_High Quality Grinding Equipment_Grinding Equipment-Zhengzhou Shuguang Heavy Machinery Co., Ltd. Product summary:Shuguang waste tire recycling production line, is a rare in the whole of the EU CE certification with high standard of quality certification. Shuguang waste tire recycling production line, is a rare in the whole of the EU CE certification with high standard of quality certification. This tire recycling production line can be based on customer requirements, recycling within the range of tires 400-3000 mm diameter, strong applicability, the size of the output material can be controlled in the range of 5-100 mm, production can reach 200-10000 kg/h. The whole tire recycling production line can effectively realize the automatic separation of rubber, steel wire, nylon fiber and other materials, the whole line adopts PLC control system, it is easy to operate and maintain, and has the characteristics of low energy consumption and long service life. 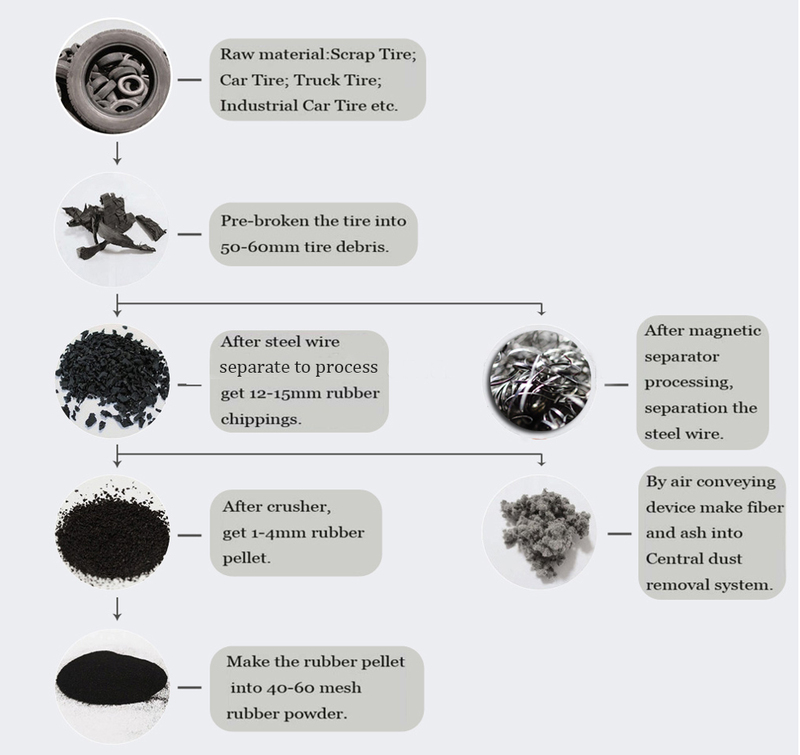 The Rubber Powder that recycled from the scrap tires are widely use in the industries.It is mainly used as modified asphalt for highway construction and it is one of the biggest consumption markets for rubber granulates. Waste tire recycling production line made of different type heavy equipment,it can realize separate car tire,truck tire and engineering tire fully automatically.Based on client demand,make rubber material pelleting and grinding,this series tire recycling production line working under normal temperature,no need any chemical additive,won't cause secondary environment pollution.Choosing the suitable model machine,we make the proposal closed to real production demand,let user control cost and get ultimate pay back by waste tire recycling machine. For raw materials: used car tires, truck tires, truck tires, engineering vehicle tires, etc. 1. The tire drawing machine - used to separate the steel wire inside the entire tire. 3, biaxial transfer 1200 tire shredder - tire shredding, the finished product can reach 4-8cm block. 6, rubber particle machine - crushed to smaller than 5mm small particles, 1-3mm, 2-4mm, powder, three specifications. 7. Pulverizer - Sale of 20 to 80 mesh rubber powder. By choosing the right model, we integrate solutions that fit the actual sales requirements. Allows users to get a cost-effective sales line while controlling investment as much as possible.